I don’t know how, but for some crazy reason, I fell two seasons behind on Downton Abbey these past few years. And after literally every person on the planet seemed to watch and rave about the grand finale a few weeks ago, I realized it was high time to catch up. I didn’t have quite the open weekend that I had last month, when I marathon-watched all of the new season of House Of Cards the second it was released. But I’ve found that Mrs. Patmore and Daisy and Ivy and the rest of the staff mulling around the Downton kitchen are great company in mine, and I hung out with them and the rest of the “upstairs” cast while I was doing some cooking this weekend. And I must say, it was as though no time had passed between us. How is it that I love this family so much? Especially when — I know no one wants to admit this — it’s really all a total soap opera, albeit with British accents and (absolutely gorgeous) twenties costumes?? Well, either way, I’m completely hooked on all things Downton again, and can pretty much guarantee you that the next few weeks’ worth of recipes here on the blog will be cooked in my kitchen with their adventures on in the background. 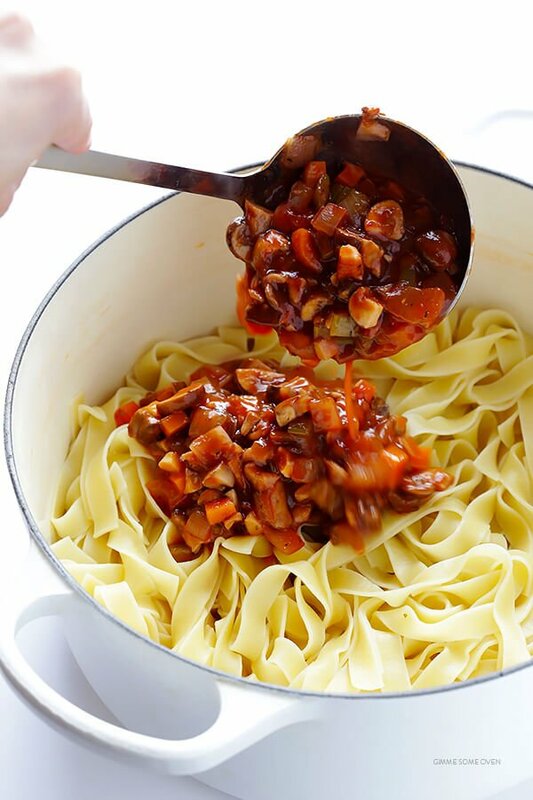 I was channeling my own Mrs. Patmore this past week as I whipped up this vegetarian/vegan version of a classic bolognese pasta. It’s chock-full of various kinds of mushrooms (use whatever you can find! 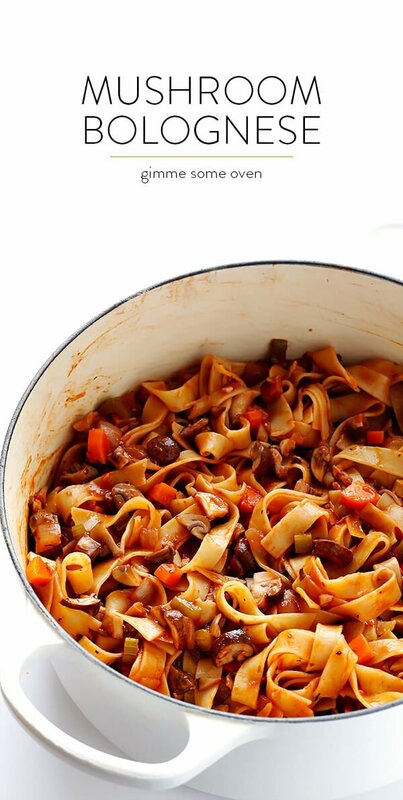 ), and it’s definitely so delicious and hearty that I promise you won’t miss the beef. 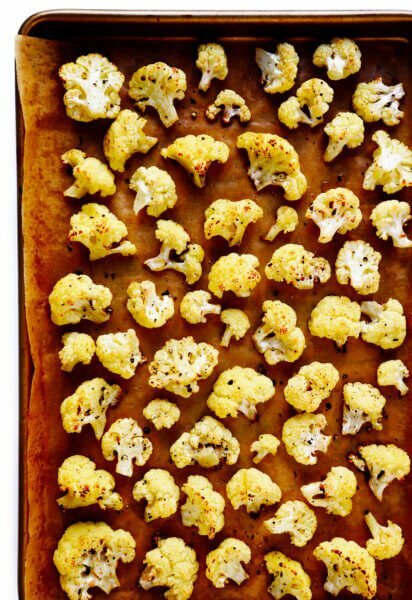 So if you’re looking for a new vegetarian dish for your Meatless Monday — or Tuesday, or Wednesday, or any ol’ day of the week — I think you’re going to love it. As I said, feel free to use whatever kinds of mushrooms you can get your hands on. My grocery store is now selling a yummy mix of cremini, shiitake and porcini mushrooms. So I just combined those with a carton of baby bellas, washed and chopped them all up, and then added them to this tasty bolognese sauce. As you can see, it literally is overflowing with vegetables. Carrots, celery, onion, ‘shrooms — yes please. 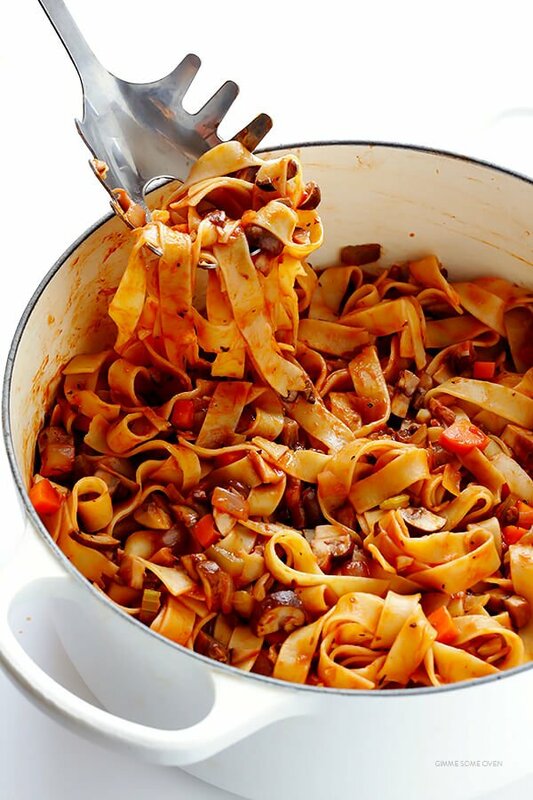 Then when simmered with garlic, tomato sauce, red wine and a few seasonings, it turns into the most flavorful fresh sauce that is just begging to be tossed with some pasta. Toss it with the sauce. Then serve it up nice and hot, and sprinkle it with a few generous pinches of freshly-grated Parmesan. 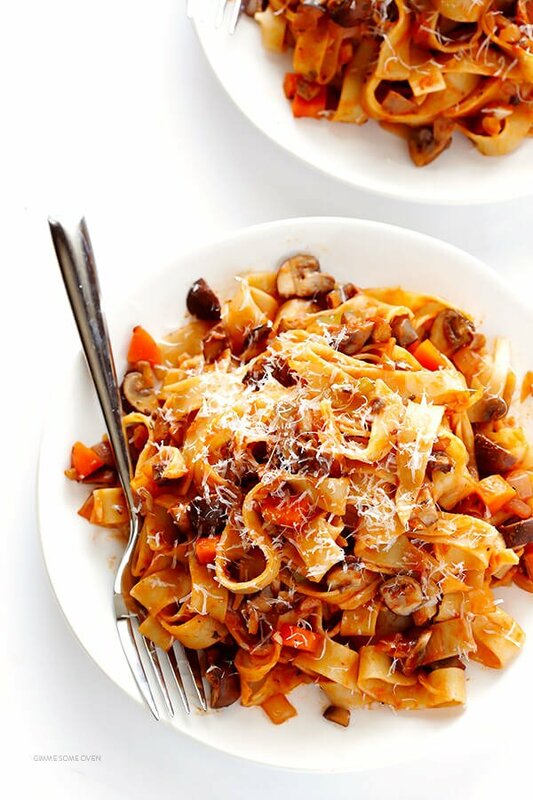 This Mushroom Bolognese recipe is an easy, hearty, and oh-so-delicious vegetarian (and vegan!) 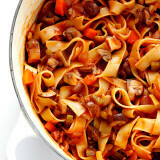 take on traditional bolognese. Meanwhile, in a separate large saute pan, add the butter and cook over medium-high heat until melted. 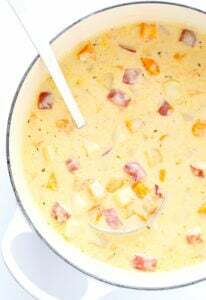 Add the onion, carrot and celery and saute for 6-8 minutes, stirring occasionally, until the vegetables are softened and mostly cooked through. Add the garlic and mushrooms and continue cooking for an additional 4-5 minutes until the mushrooms are browned, and all of the vegetables are completely cooked through. Pour in the wine, and give the mixture a good stir. Let the mixture come to a boil and simmer for about 2-3 minutes, or until the wine is reduced by about half. Add in the vegetable stock, tomato sauce, bay leaf, Italian seasoning, and a generous pinch of salt and pepper. Stir to combine. Let the mixture continue cooking until it comes to simmer. Then reduce heat to medium-low, and simmer uncover for about 10 minutes so that it slightly reduces. Taste, and season with extra salt, pepper, Italian seasoning, and/or crushed red pepper if needed. 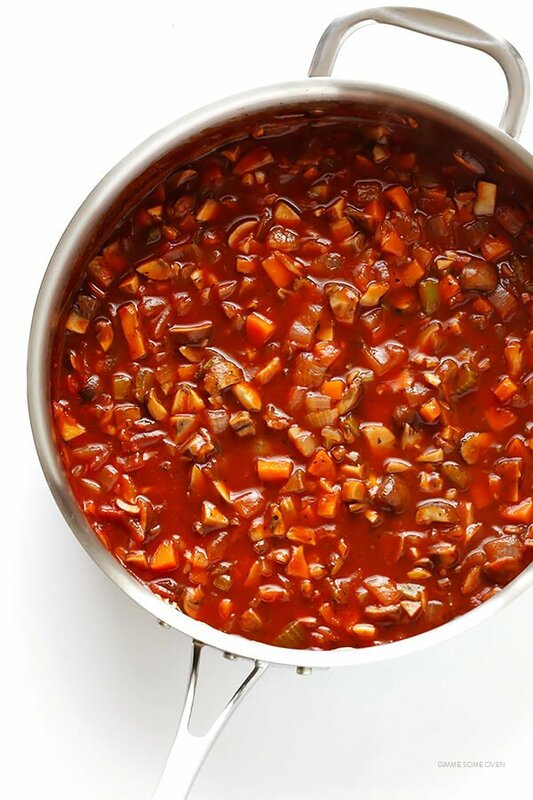 Once the pasta is cooked and drained, combine it with the sauce and toss until combined. Serve immediately, garnished generously with Parmesan. *If you don’t have pre-mixed Italian seasoning, you could substitute in 1/4 teaspoon dried oregano and 1/2 teaspoon dried thyme. MMMMMmmmm! This pasta has got me written all over it! 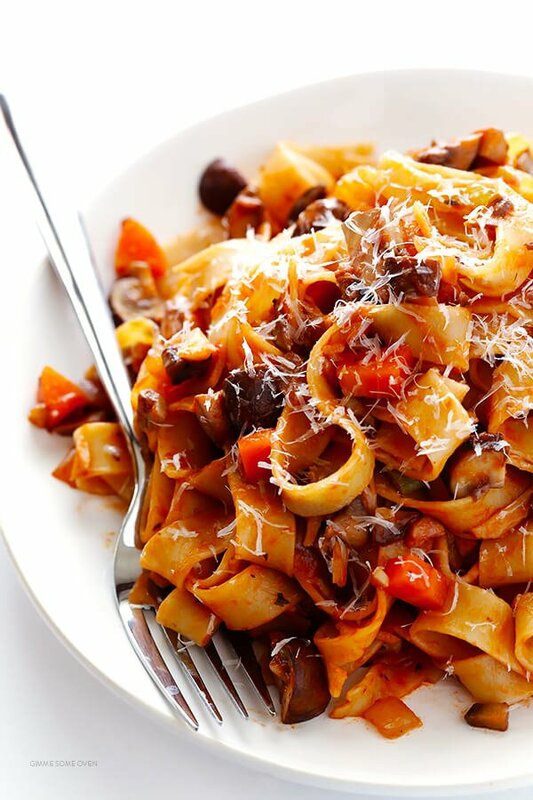 I love making bolognese with mushrooms! Your recipe sounds wonderful too. Definitely will give it a try! It’s not even lunch time yet, and this post is making me HANGRY. Looks so good! I’m also behind on my Downton Abbey. I really need to catch up!!! I love a nice meatless Monday meal too! I am pinning for later! First of all, LOVE your blog. Not only for the recipes but for the prettiness (especially the photos, which I guess you know are kind of your mark). It’s one of my few favourite marked pages in my phone. Weird ting from Sweden, it’s not always we have the same ingredients as you, but I have never asked anything before since I guess you’re too busy to answer everybody who loves you. Anyway, one thing we DO have is red wine, only not me atm. Hence question: if I have 1) red balsamic vinegar and 2) white wine regular vinegar, is it possible to use these/one of these interchangeable with the red wine? In that case, do you have any knowledge of the ratio to use when so? 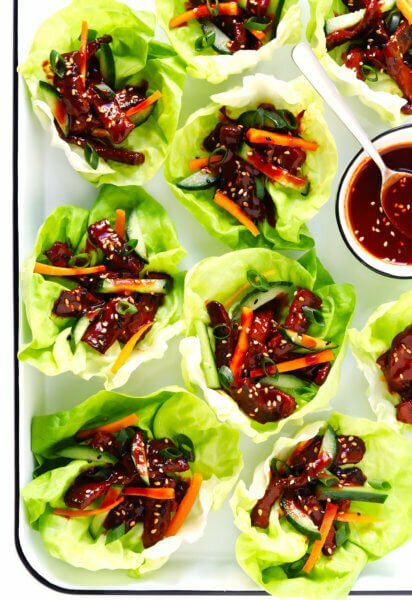 This recipe is AMAZING, thank you for sharing! I just followed your blog- so happy I stumbled upon it. I love pasta and I love mushrooms. Combining my favorites into a single dish. That sauce looks so fresh and vibrant. Very beautiful and healthy dinner plate. If celery is not available, which other vegetable can be used to substitute it? Hi Jaina! If you aren’t able to find celery, we would just use a little extra carrot and onion. We hope you enjoy! making this tonight! So glad I stumbled upon your page! Hopefully my tired hubby doesn’t notice there isn’t meat involved (he’s carnivore, me…not so much). Quick question, I looked at our international store nearby for the pasta but no luck…where did you find yours? I am subbing with fettuccine hope it works! Hey Jenny! 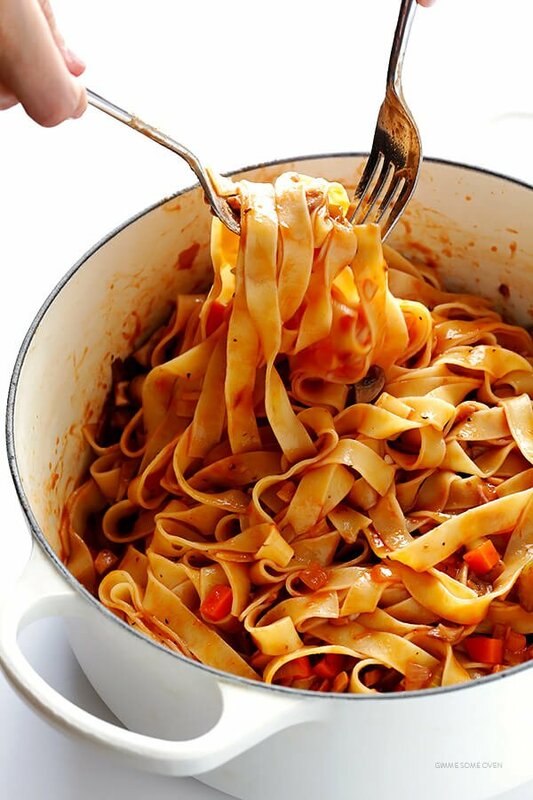 :) Fettuccine — or really, any noodle shape — should definitely work. Hope that you guys enjoyed it! 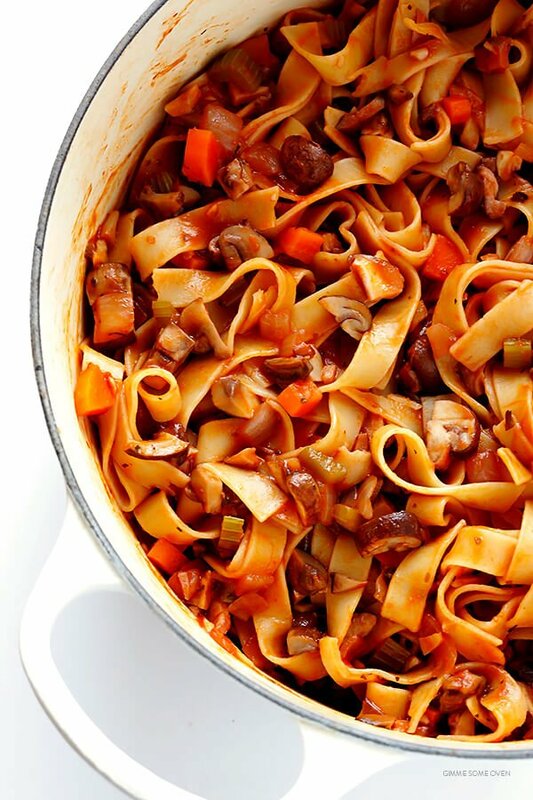 Do you think this would freeze well, like a meat bolognese? I worry that the mushrooms may get soggy?? Hi Maura! We haven’t tried freezing this ourselves, but we think it would freeze okay. We wouldn’t really recommend freezing the pasta with it though. We hope this helps and that you enjoy! Looks delicious :) Just one thing, though, actual Parmesan cheese, if made to the correct recipe, isn’t vegetarian, as it uses animal rennet. Therefore anyone using Parmesan in this isn’t making a vegetarian dish. They’d need to use a hard cheese alternative. I’ve made many of your recipes and have yet to find one I don’t absolutely love! I came upon this one when trying to find a use for all the organic ground beef we have (12 LBS! when it’s $4/lb you stock up!) I was wondering if it would be acceptable since we are making this on a Friday not a Meatless Monday, to throw in a pound of the ground beef to pay homage to a traditional bolognese sauce. Thank you!! Made this last night and had it for lunch today – the flavors had time to marinate beautifully! Will definitely make again! I am a vegetarian and loved the dish, my husband is a real meat lover but he really liked the dish as well. Thanks for the great recipe! Made it, totally delicious and comforting! I really liked this! My boyfriend is more of a meat-eater than myself, and he still enjoyed it so much he went for seconds. I added a can of crushed tomatoes as I prefer a thicker sauce, and used whole wheat thin spaghetti. I made this and it was a huge hit! My family loved it and I’ll be making it again very soon! Thanks for the awesome recipe! This recipe was really good! I tried my best not to make any changes but since I was short on a few ingredients I had to improvise. I added Italian seasoning instead of thyme and chicken stock instead of wine. And instead of wild mushrooms, shiitake instead. Heirloom tomatoes instead of tinned. Besides that, followed the instructions to a T and it turned out wonderfully. Served it over spaghetti squash since we watch our carbs. Thanks for sharing!